The current recommended target is to achieve remission, if not at least low disease activity (LDA) in management of rheumatoid arthritis (RA). We analysed the incidence of patients achieving LDA or in remission in a real time clinical situation in a tertiary referral rheu- matology centre, at a given point of time. Materials and methods: We reviewed 480 patients who fulfilled classification criteria for RA and who were assessed for 28 Tender Joint Count (TJC), Swollen Joint Count (SJC), ESR and CRP. Their DAS28 (3) CRP and DAS28 (3) ESR score were calculated and were classified into LDA, remission, low, moderate and high disease activity based on the DAS28 (3) score. Results: 5.9% and 21.9% were in remission and 12% and 10% were in LDA based on DAS28 (3) ESR and DAS28 (3) CRP respectively. There was no significant influence of duration of illness, treatment and age in attaining both LDA and remission in our population. Conclusion: 5.9% and 21.9% of RA were in remission based on DAS28 (3) ESR and DAS28 (3) CRP respectively and 12% and 10% of RA patients were in LDA based on DAS28 (3) ESR and DAS28 (3) CRP respectively at the point of our study. DAS (3) CRP overestimate remission compared to DAS28 (3) ESR. Background: Primary hypothyroidism is one of the major endocrine diseases involving various organs including the musculoskeletal system leading to increased morbidity. Objective: To observe the different rheumatic manifestations in patients suffering from primary hypothyroidism. Patients and methods: A total of 120 patients suffering from primary hypothyroidism with different rheumatic manifestations were evaluated. Results: Male to female ratio was 1:3 with mean age of 27 (±4.6) years and the mean body mass index (BMI) was 29.3 (±3.4) kg/m2. Musculoskeletal disorders observed were e body ache and myalgia in 100 (83.33%), muscle cramps and stiffness in 100 (83.33%), low back pain in 60 (50%), arthralgia in 30 (25%), adhesive capsulitis in 25 (20.8%), limited joint mobility in 20 (16.67%), myopathy in 10 (8.33%), carpal tunnel syndrome in 8 (6.6%), trigger finger in 5 (4.1%), Dupuytren's contracture in 4 (3.33%) and tarsal tunnel syndrome in two patients (1.6%). Rheumatologic disorders associated were e osteoarthritis in 80 (66.7%), mild inflammatory arthritis involving hand joints in 60 (50%), rheumatoid arthritis in 20 (16.67%), SLE in 10 (8.33%), fibromyalgia in 6 (5%), Raynaud's phenomenon in 2 (1.66%) and mixed connective tissue disease in 2 patients (1.66%). Other autoimmune disorders asso- ciated were vitiligo in 6 (5%), lichen planus in 4 (3.33%), recurrent aphthous stomatitis in 4 (3.33%) and alopecia areata in 4 patients (3.33%). Laboratory abnormalities detected were thyroid autoantibody (anti-TPO) in 40 (33.3%), elevated CPK enzyme in 40 (33.3%), rheu- matoid factor in 14 (11.7%) and ANA in 4 (3.3%) cases. Conclusion: Rheumatic disorders in patients with primary hypothyroidism were significant disease manifestations and early identification along with effective management is essential. Background: Rheumatoid arthritis (RA) has a worldwide distribution affecting 0.5e3% of the population. We used Stanford Health Assessment Questionnaire (HAQ) to assess the quality of life (QOL) in a sample of patients with RA. Disability assessment component of the HAQ; the HAQ-DI, assesses a patient's level of functional ability and has been validated and used in clinical trials extensively. Objective: To find the impact of illness on quality of life, in a sample of patients with RA using HAQ, and to calculate the HAQ-DI. Additionally, to find the age distribution and relationship of HAQ-DI with VAS, DAS28 and duration of illness. Methodology: A self administered questionnaire was used in a random sample of 100 patients attending a rheumatology clinic. Statistical analysis was done using the SPSS statistical package version 17 (SPSS Institute, Chicago). Results: We had a 100% female population with mild disease [HAQ-DI (0e<1)] in 62% of patients, while severe disease (�2 and ::;3) was found in 5%. RA prevalence was highest in 41e50 years group (mean age ± SD ¼ 50.8 ± 11.5 years). VAS had a positive correlation with HAQ-DI. Relationship of HAQ-DI and DAS28 was not statistically significant ( p ¼ 0.72), although there was a positive correlation between DAS28 and HAQ-DI in disease duration more than 5 years group (r ¼ 0.19). Mean HAQ score was the highest in more than 10 years disease duration population ( p ¼ 0.006). Conclusion: In a busy clinic setting, simple parameters like disease duration and VAS give an indication about the functional effect of illness on a patient's quality of life. Research is essential for progress. Scientific advances in medicine depend upon research. Research does not always depend upon so called facilities. Research attitude is more important. This needs to be encouraged and imbibed. Curiosity, observation, perseverance, asking questions are some of the attributes of a researcher. Research can explore funda- mentals or be clinical. Discussion, interactions are important sources of research ideas. Simple case reports can be the beginning of a major discovery. Indians are not at the forefront of research. Why? These are some of the ideas covered in this article. The quality of published research is highly variable and it is critically important for the busy clinicians to be able to appraise published papers and make up their own mind about the evidence that is presented in the papers read. To be able to do this reader does not necessarily need to be an expert in research methodology or a statistician. We in this article present some basic information and a list of questions which when asked sys- tematically would help the readers appraise a scientific paper. Nutritional transition in globalization accompanies the rapid spread of chronic auto- inflammatory disorders of metabolic and immune origins, amid increasing age span. Rheumatology stands at cross roads meeting the epidemic and the expectations of medico- scientific advances in 21st century. Nutritional medicine is newly emerging interdiscipline with holistic address to sciences, in apparent contrast to reductionist developmental course opted in almost all specialties. 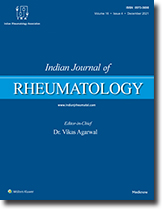 The article singularly aims to draw attention of clinical research enthusiasts on the vital interdisciplinary context, highly relevant to advance of rheumatologic science and practice in contemporary India. KikuchieFujimoto disease (KFD), or histiocytic necrotising lymphadenitis, is a rare benign, self-limiting cervical lymphadenitis of unknown aetiology. It predominantly affects young women and can closely mimic infective and immunological disorders. There is also a rare but documented association with systemic lupus erythematosus (SLE). We present the case of a young woman with biopsy-proven KD who was also diagnosed with SLE.